#Get Memory Information. The data will be shown in a table as GB, rounded to the nearest second decimal. #Add data to the infoObjects. 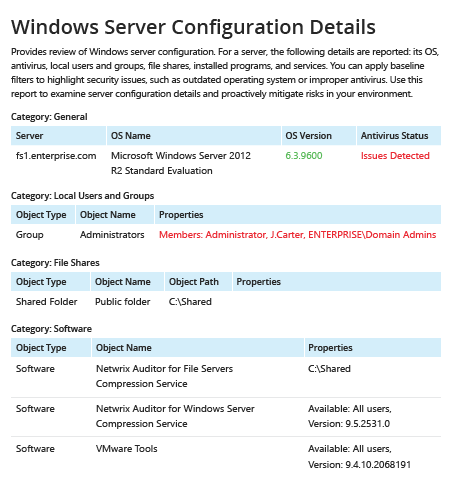 Run Netwrix Auditor → Navigate to "Reports" → Expand the "Windows Server" section → Go to "Windows Server – State-in-Time" → Select "Windows Server Configuration Details" → Click "View". To ensure you have an accurate understanding of your critical assets, you need a complete, up-to-date hardware inventory and a thorough software inventory that includes what Windows Servers you have in your domain, what version of the OS runs on them (such as Windows Server 2012 or Windows Server 2008) and whether they are well-protected from external attacks. 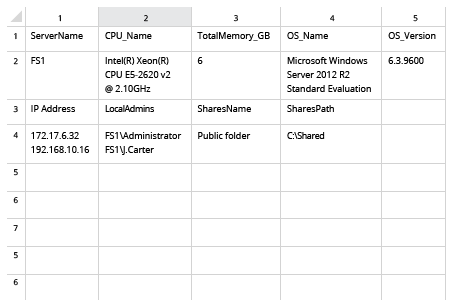 A PowerShell script to collect server inventory can help you get a list of servers. However, gathering all the important details and producing a useful report requires time, effort and a solid knowledge of PowerShell. Netwrix Auditor for Windows Server delivers all the details you need about all the servers across your organization in one comprehensive, easy-to-read report, which you can easily export to a CSV file and use in Excel, or to a PFD file. The report is rich with info such as the name and version of the OS installed on each server and the antivirus status. Simply apply filters to the report to detect any deviations from your proper baseline, so you can immediately take action to harden the security of your computers and data.